Mondays: 7:30 a.m. to 9:00 p.m.
Tuesdays: 7:30 a.m. to 9:00 p.m.
Saturdays: 8:00 a.m. to 10:00 a.m. The canvas labyrinth is available for walking in Anderson Hall between 6:00 and 7:30 p.m. on the evenings of Taizé services. 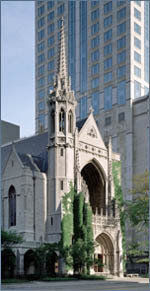 Before coming to walk the labyrinth, please call the church office at 312.787.4570 or check the website calendar to confirm that the chapel is not being otherwise used at the time you plan to walk. Walking the labyrinth at Fourth Church takes approximately twenty minutes. Guidelines for self-guided walks are available near the entrance to Buchanan Chapel. prior to the 7:30 p.m. Taizé service. A labyrinth is a walking tool for prayer and meditation for those seeking God. Rediscovered in recent years as a fruitful spiritual practice, it is an archetypal sacred pattern for walking a path of pilgrimage and is found in many religious traditions in various forms around the world. In walking the labyrinth, mind, body, and spirit are together focused on following a single path that leads to and returns from the center. The medieval labyrinth pattern that is followed today evolved during the twelfth and thirteenth centuries, when designs were incorporated into Gothic cathedrals, most notably at Chartres in France. The labyrinth, which has a single, winding pathway, is not a maze. One does not have to think about finding the right way or worry about getting lost. Instead, one simply walks in trust, receptive to what the Spirit may be inviting us to recognize, release, or discover. The path thus becomes a mirror for where we are in our lives. It touches our sorrows and releases our joys and creativity. It is also a place of presence; which can help us listen to inner wisdom and gain new understandings. Each time we walk the labyrinth we may find ourselves led further to discover and do that toward which our soul is drawn. The labyrinth at Fourth Church is made of limestone tiles and is set into the floor of Buchanan Chapel. A modified version of the medieval labyrinth pattern in Chartres Cathedral in France, it has seven circuits. 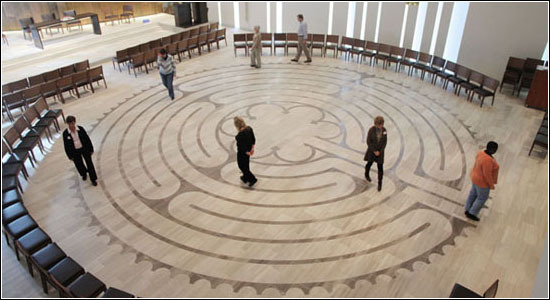 The church also has a twelve-circuit canvas labyrinth that is portable and is used on occasion. 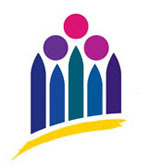 This resource is administered by the Labyrinth Ministry Committee. To receive periodic email updates about labyrinth walks at Fourth Church, please send your email address to news@fourthchurch.org and note “Labyrinth” in the subject line. To learn more about the labyrinth, pick up a copy of Christian Prayer and Labyrinths: Pathways to Faith, Hope, and Love by Jill Kimberly Hartwell Geoffrion, which is available at the Book Nook during Sunday morning Coffee Hour or contact Vicky Curtiss, Associate Pastor at 312.981.3598.